علیدادی, حسین, رمضانی, اعظم, محب‌راد, بتول, دهقان, علی اکبر, اسماعیلی, حبیب الله, رافع, شهربانو, دولت آبادی, مریم, پایدار, مریم. (1395). بررسی میزان آرسنیک موجود در منابع آبی روستاهای شهرریوش و مقایسه با استانداردهای موجود با استفاده ازGIS. مجله آب و فاضلاب, 27(6), 87-91. حسین علیدادی; اعظم رمضانی; بتول محب‌راد; علی اکبر دهقان; حبیب الله اسماعیلی; شهربانو رافع; مریم دولت آبادی; مریم پایدار. "بررسی میزان آرسنیک موجود در منابع آبی روستاهای شهرریوش و مقایسه با استانداردهای موجود با استفاده ازGIS". مجله آب و فاضلاب, 27, 6, 1395, 87-91. علیدادی, حسین, رمضانی, اعظم, محب‌راد, بتول, دهقان, علی اکبر, اسماعیلی, حبیب الله, رافع, شهربانو, دولت آبادی, مریم, پایدار, مریم. (1395). 'بررسی میزان آرسنیک موجود در منابع آبی روستاهای شهرریوش و مقایسه با استانداردهای موجود با استفاده ازGIS', مجله آب و فاضلاب, 27(6), pp. 87-91. علیدادی, حسین, رمضانی, اعظم, محب‌راد, بتول, دهقان, علی اکبر, اسماعیلی, حبیب الله, رافع, شهربانو, دولت آبادی, مریم, پایدار, مریم. بررسی میزان آرسنیک موجود در منابع آبی روستاهای شهرریوش و مقایسه با استانداردهای موجود با استفاده ازGIS. مجله آب و فاضلاب, 1395; 27(6): 87-91. آرسنیک یکی ازخطرناک‌ترین عناصر موجود در آب ‌آشامیدنی است. مصرف آب آلوده به آرسنیک باعث بروز انواع بیماری‌های مختلف از جمله سرطان‌ها می‌شود. این مطالعه به‌منظور بررسی غلظت آرسنیک در منابع آب روستایی شهر ریوش کاشمر انجام گرفت. 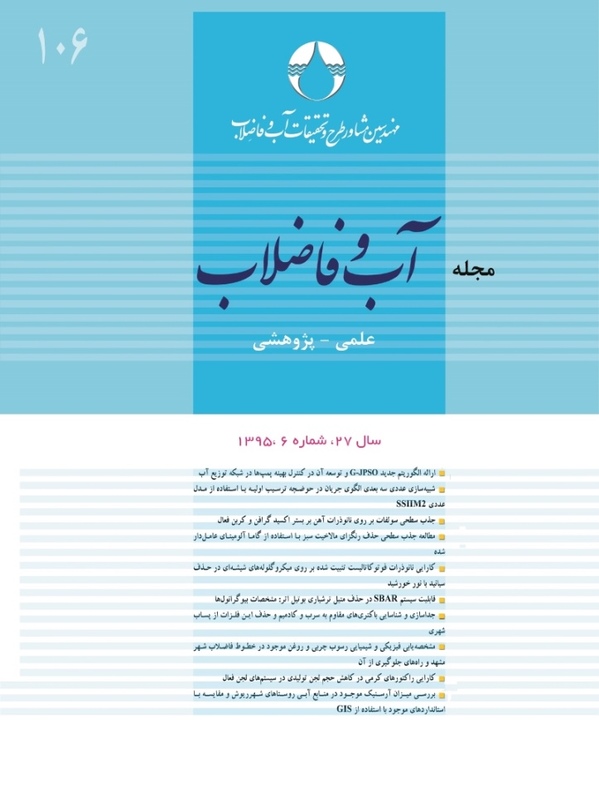 در این مطالعه توصیفی–تحلیلی مقطعی، 60 نمونه از 10 منبع آب شرب زیرزمینی شهر ریوش در طی ماه‌های اردیبهشت تا مرداد 1392 جمع‌آوری شد. نمونه‌برداری و محافظت نمونه‌ها مطابق با استاندارد متد انجام گرفت و توسط دستگاه جذب اتمی به روش VGA اندازه‌گیری شد. به‌منظور سنجش وجود ارتباط بین غلظت آرسنیک در آب و عواملی همچونpH، کلر باقیمانده، EC،TDS ، شوری و دما این عوامل نیز اندازه‌گیری شد و میزان آرسنیک با استانداردهای ملی و بین المللی مقایسه شد. میانگین غلظت آرسنیک در ایستگاه‌های A،B،C،D،E،F،G،H،I،J به‌ترتیب03/1±53/1،07/1±30/1، 83/3±55/10، 01/5±21/11، 68/3±57/10، 73/0±34/2، 58/0±22/3، 57/3±89/9، 07/5±48/10، 53/0±23/2 میکروگرم در لیتر بود. غلظت آرسنیک در پنج ایستگاه بیشتر از رهنمودهای WHO بود ولی در سایر ایستگاه‌ها بیش از استاندارد ملی نبود. میزان آرسنیک نسبت به استاندارد ملی دارای تفاوت معنی‌دار (001/0>P)، ولی نسبت به استاندارد بین‌المللی تنها 50 درصد ایستگاه‌ها دارای تفاوت معنی‌دار (001/0>P) بودند. همچنین ارتباط معنی‌داری بین غلظت آرسنیک و TDS, EC، دما، شوری و کلر باقیمانده به‌جز pH وجود نداشت. برنامه‌ریزی برای جایگزینی آب آشامیدنی سالم با منابع موجود در مناطقی که میزان آرسنیک بیش از استاندارد بین‌المللی است و همچنین برای کنترل مداوم منابع آبی ضروری است. Arsenic is one of the most hazardous elements in drinking water. Water contaminated with arsenic causes a variety of diseases in humans including cancer. The present study was conducted to survey Arsenic concentration in rural water resources in Rivash Twon, Kashmar, Iran. For the purposes of this cross-sectional study, 60 samples were collected from 10 underground drinking water supplies during the period from April to June, 2013. Samplings and sample preservation were performed according to standard methods. Measurements were performed via the VGA method using atomic absorption. Such water quality parameters as pH, TDS, EC, residual chlorine, and temperaturte were also measured to determine any relationships likely to exist between As concentration and the parameters measured. As levels were then compared with national and international standards. It was found that the average values of As concentration at the stations A, B, C, D, E, F, G, H, I, and J were 1.53±1.03, 1.30±1.07, 10.55±3.83, 11.21±5.01, 10.57±3.68, 2.34±0.73, 3.22±0.58, 9.89±3.57, 10.48±5.07, and 2.23±0.53 µg/L-1, respectively. As concentrations at five stations were found to be higher than the values recommended in WHO guidelines; the remaining stations revealed values below the national standard. While the differences between As level and the national standard were statistically significant (p<0.001), those between As level and WHO standard were significant (p<0.001) in 50% of the stations studied. Except in the case of pH, no significant relationships were detected between As level and any of the TDS, EC, temperature, salinity, or residual chlorine values. From the results of this study, it may be suggested that it is essential to plan for replacing safe drinking water supplies for the current polluted ones with high AS levels in the district. Controlling the present water supplies on a regular basis is also highly recommended. 2. Hosseinpour Feizi, M.A., Mosaferi, M., Dastgiri, S., and Kusha, A. (2009). “Study of arsenic presence in drinking water: a case study in East Azerbaijan province.” 12th National Conference on Environmental Health, Shahid Beheshti University of Medical Sciences, Department of Health, (Tehran), pp. 40-51. 4. Babai, Y., Ghasem Zadeh, F., Arbab Zavvar, M.H., and Alavi Moghaddam, M.R. (2007). “Experimental study of arsenic removal from contaminated water by macroscopic algae Kara.” Environmental Science and Technology, 9(2), 11-18. 5. Ebrahimpoor, S., Mohammadzadeh, H., and Nasseri, N. (2010). “Arsenic contamination of ground waters and its effects on human health.” Proceedings of the First National Conference of Applied Research on Water Resources of Iran, Kermanshah Regional Water Co., Kermanshah, 269-282. 6. Shukla, D.P., Dubey, C.S., Singh, N.P., Tajbakhsh, M., and Chaudhry, M. (2010). “Sources and controls of Arsenic contamination in groundwater of Rajnandgaon and Kanker District, Chattisgarh Central India.” Journal of Hydrology, 395, 49-66. 7. Salameh, Y., Al-Lagtah, N., Ahmad, M.N.M., Allen, S.J., and Walker, G.M. (2010). “Kinetic and thermodynamic investigations on arsenic adsorption onto dolomitic sorbents.” Chemical Engineering Journal, 160(2), 440-446. 8. Lim, J-W., Chang, Y-Y., Yang, J-K., and Lee, S-M. (2009). “Adsorption of arsenic on the reused sanding wastes calcined at different temperatures.” Colloids and Surfaces A: Physicochemical and Engineering Aspects, 345(1-3), 65-70. 9. Vasireddy, D. (2006). “Arsenic adsorption onto iron-chitosan composite from drinking water.” MSc Thesis, University of Missouri, Columbia. 11. Mozafarian, K., Madaeni, S.S., and Khoshnodie, M. (2006). “Evaluating the performance of reverse osmosis in arsenic removal from water.” J. Water and Wastewater, Vol. 17 No. 4(60), 22-28. 13. Babaei, Y., Alavi Moghaddam M.R., Ghasem Zadeh, F., and Arbab Zavvar, M.H. (2008). “Study of arsenic contamination of surface waters in the area of Kashmar Koohsorkh.” Environmental Science and Technology, 10(3), 29- 35. 14. Mesdaghinia, A.R., Mosaferi, M., Yunesian, M., Nasseri, S., and Mahvi, A.H. (2005). “Measurement of arsenic concentration in drinking water of a polluted area using a field and SDDC methods accompanied by assessment of precision and accuracy of each method.” Journal of Hakim, 8(1), 43-51. 15. Agusa, T., Kunito, T., Fujihara, J., Kubota, R., Minh, T.B., Trang, P.T.K., Iwata, H., Subramanian, A., Viet, P.H., and Tanabe, S. (2006). “Contamination by arsenic and other trace elements in tube-well water and its risk assessment to humans in Hanoi, Vietnam.” Environmental Pollution, 139(1), 95-106.